Everyone has some aspect of their character or behavior that irritates their partner – at least once in a while! But did you realize that you can use your “shortcomings” to improve your relationship? The trick is how you respond when your partner brings up something about you that’s difficult to hear. In this one hour session with Dr. Bader and Dr. Pearson, they change the way you respond to these tough discussions. You’ll feel better, and your partner will, too! to be understood or avoid feeling controlled. Dr. Ellyn Bader is Co-Founder & Director of The Couples Institute in Menlo Park, California. As therapists, workshop leaders, authors, and speakers, they are dedicated to helping couples create extraordinary relationships. They educate, enlighten and entertain while presenting innovative, practical ways to help you improve your relationship. 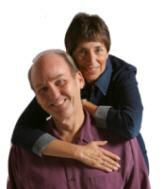 Peter and Ellyn have been featured on over 50 radio and television programs including “The Today Show” and “CBS Early Morning News.” They have been married to each other for 24 years and have worked together for 26 years. They have had multiple opportunities to practice what they preach. "Claim Your Free Audio" button.